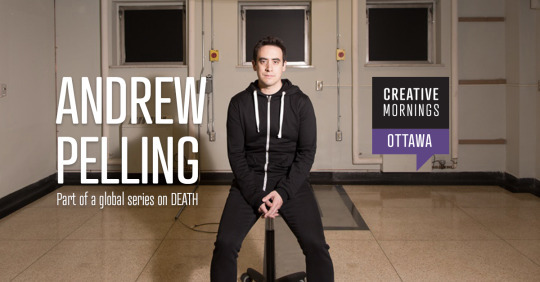 Join us on Friday, November 24 at the University of Ottawa Telfer School of Management as we welcome Ted Fellow, Dr. Andrew Pelling to the CreativeMornings Ottawa stage as this month’s speaker on our global theme death! His laboratory discoveries and advances are all predicated on death and the semi-living. The The living cells and tissues they study, and the products required to maintain them, are all a product of death. Ultimately, the creative scientific process of discovery is made stronger because it demands death - the death of ideas, hypotheses and specimens. Tickets are FREE and will be available HERE at 11 a.m. sharp on Friday, November 17. You wan’t want to miss this one! Make plans to join us at EcoEquitable on Friday, October 27, when Ottawa Fashion Designer, Stacey Bafi-Yeboa will speak on the global theme of “pioneer”. You might be on the edge of pioneering something new; only time and your relentless drive to create against all odds will determine that. We look towards pioneers to bring us to new discoveries, domains, and knowledge about ourselves. Tickets are FREE and will be available at https://creativemornings.com/talks/stacey-bafi-yeboa at 11 a.m. sharp on Friday, October 20. Mark your calendar, set your alarm, and don’t sleep in TOO late! EcoEquitable will be hosting a Textile Summit throughout the day on October 27, click here for more info. Hey! We’re doing things a little differently this month this month! We’re hosting a special CreativeMornings on Tuesday (that’s right, not Friday), September 26 at the new National Art Centre at 8 a.m. (30 mins earlier than usual). 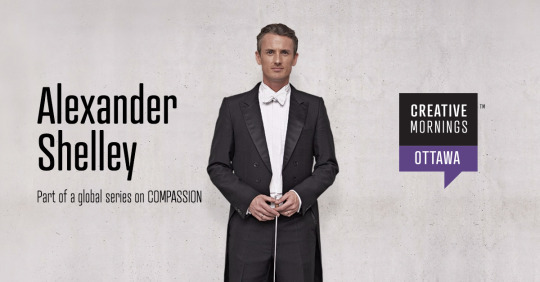 We’re honoured to welcome Alexander Shelley, Music Director of the NAC Orchestra t the CreativeMornings stage to lead us in a discussion about this month’s global theme: Compassion. The event is free, but you have to RSVP! 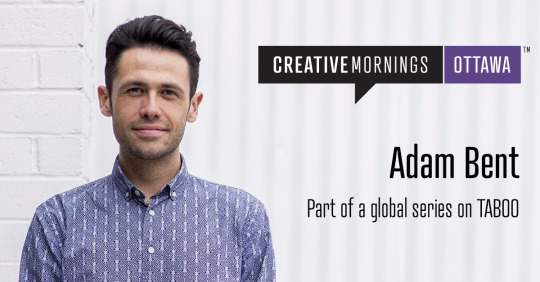 Registration opens here –> https://creativemornings.com/talks/alexander-shelley at 11 a.m. on Tuesday, September 19! Limited seats available so don’t miss out! 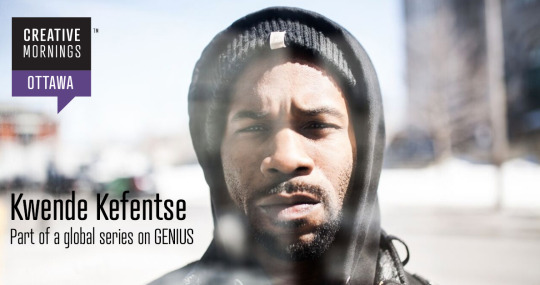 Mark your calendars and join us at the Horticulture Building at Lansdowne Park on Friday, August 25, as Kwende Kefentse takes to the CreativeMornings Ottawa stage as our August speaker on the global theme of “Genius.” You’ll hear about the concept of Genius Loci - the phenomenology of place. Kwende will tell the story of how he came across the term and how it's changed his life trajectory. Tickets are FREE and will be available at https://creativemornings.com/talks/kwende-kefentse at 11 a.m. sharp on Friday, August 18. Set your alarm, and don’t sleep in TOO late! Photo was taken by Ottawa photographer, Rémi Thériault . While strict diets and hours of hard workouts may not necessarily be on the top of everyone’s things-that-thrill-us list, it is hard to deny that an active and cheerful morning routine can mean the difference between feeling on top of your game or at the bottom of it! I get out of bed at 7:00 AM and pick up my headphones. I play some of my favourite groovy tunes and think of the day’s agenda. From there, I head out for a morning walk to clear my mind and loosen up. This is followed by a great breakfast and more eclectic music. How long have you been following this routine for and why is it important to you? I’ve been doing this for as long as I’ve been committed to becoming an elite athlete. I realized I needed to wake up every day with a burning desire to pursue my goal. My routine is what gets me in that state of mind. What time do you typically wake up and go to bed? I make it to bed around 11:30 PM and I rise at 7:00 AM - that’s what works for me! We have to ask: Do you hit snooze? How often? No snoozing for me. I sometimes wake before my alarm, if it does beat me, I usually get up after the third ring. Would you say it is important to you to get a certain amount of sleep in a night? Not necessarily. It depends on how taxed my body is from the day and what activities lie ahead. I’ve had some of my best performances on less than 4 hours of sleep. While still in bed, I examine my muscles for soreness from the previous night’s training. I proceed to stretch and activate the sore areas, followed by a back adjustment. It’s a great way to start the morning. Do you answer emails first thing in the morning or leave it until later in the day? I respond to short emails during breakfast and sometimes throughout the day. Long emails are for the evening. Does your morning routine change on weekends? How? My routine does change. Saturdays are my hardest training days so I spend most Fridays mentally preparing for the strenuous training session. I eat smarter and I spend a lot of time reading, listening to inspirational talks. I also get to bed earlier than usual. What do you do in the morning that makes you feel the most prepared to start your day? I listen to my favourite tunes with my good friend, coffee. I simply adjust. Those are old cars days. It may take a while to get my engine started, but I dig deep and do some positive self-talk. soon after the engine gets going. Free tickets will be released HERE on Friday, April 21s at 11 a.m. Stay tuned and be sure to RSVP! CMers know that mornings can have a huge impact on how the rest of the day unfolds. That’s why we’re always curious to see how our inspiring speakers start off their day. I am not a morning person and prefer to be left alone for the first hour of my day. I keep my phone on do not disturb from 9 p.m. until 8:30 a.m. I hop into the shower and I always throw on “world report” on the CBC radio app. I stretch in the shower and practice some deep breathing while I start building a mental checklist of my top to-do’s that morning. Food is a huge priority for me and breakfast is usually one of three options: Granola with almond milk and bananas, cold press juice or my classic smoothie with 12 ingredients or I’ll have sourdough toast with boiled eggs, avocado and tomato all with a side of coffee of course. I get dressed based on my day’s most important meeting or how I want to feel that day, and then I walk to my office which is about 20 minutes. I’ll throw on the news or a podcast on CBC (I’m a CBC junkie). If I have a backlog of calls from the east coast from that morning, I’ll get on the phone and get through some calls on my walk. How long have you been following this routine for? Why is it important to you? I have travelled frequently my whole career so my morning routine really forms around where I am that week, my routine suits the market. I am a very adaptable person and consistency is not something I need to do my best work, in fact change of environment is a driver for me. This year I am splitting my time 30% east coast and 70% west coast, and my respective routine changes to suit the weeks priorities. Toronto has a night culture both socially and in business. Networking and after work events are much more prevalent and they are an important part of being a successful entrepreneur in that market - relationships are everything. My morning routine is not as much of a priority when I am in Toronto, I might rush out of bed and be ready in 20 minutes and out the door to my first meeting at 9 a.m. In New York I’m up early because I don’t know how to get anywhere and lots of travel planning for meetings needs to happen. In Vancouver people wear sweatpants or leggings to work and they go to bed at 9 p.m. so they can wake up and do yoga at 5 a.m. The business culture there doesn’t demand a nocturnal component so I wake up much earlier and follow more of a routine in the morning. It’s rare for me to be in bed before 11 p.m., I usually can’t get to bed until 12 or 1 a.m. Business culture tends to celebrate the early risers as a common denominator for productivity but I am glad to see research and the profiling of successful late night entrepreneurs and creatives that have been published over the last two years. There’s a lot of us out there and I think it’s an important story to tell. Do you hit snooze? How often? Absolutely, but I also set three alarms for the morning 10 minutes apart. If you mix that in with the 5 minute snooze delay, my phone is guaranteed to terrorize me out of bed. Is it important to you to get a certain amount of sleep in a night? I can get by on 5/6 hours no problem. I’m a sprinter, so I will go weeks with little sleep but definitely need a recharge week at the end of a sprint. If I haven’t slept much the night before I will have a late afternoon lull, that’s when I will switch to an hour of something less demanding of my brain like research or candidate searching. If I have a day full of meetings then I stay spry, deal making and pitching gives me a lot of energy, it’s better than coffee. When I am crawling into bed, I listen to podcasts or I read to help shift my mind off work. This helps me fall asleep faster which I suppose helps me wake up easier on a good day. In the summer I will go to the gym or run before work a few times a week. In winter I cannot be compelled to wake up early AND work out. I need to be at the gym or go to a class, I need the environment. I don’t like working out at home, even Yoga at home I can’t get into. It’s my space to cook and relax or sit at my desk. Ironically I get up as early on weekends as I do on weekdays, depending on Friday night’s activities. I love Saturday, it’s the only day I take off and when I wake up, I just lie in bed longer and I will cook a great breakfast or go for brunch. When I am in Vancouver I like to call my friends in Ontario since they are further into the day, it’s a great time to catch up. I think of my team and what everyone else is working on that day. Everyone at thisopenspace compels me to do my best work and each individual team member has a responsibility to each other and what we are building. That’s what makes me prepared to go and crush the day, alongside my incredible team. I think if you took coffee away and my breakfast then we have a problem, but other than that I’m totally unphased. Free tickets will be released on Friday, March 24 at 11 a.m. Stay tuned and be sure to RSVP! We’re always looking for tips on how to lead a more productive day, and who better to get some pointers from then our inspiring speakers! Let’s be honest… You don’t become a boss lady like Kristina without understanding a thing or two about productivity. My morning routine always comes down to 2 things: coffee and moments of pause — making space to wake up slowly, centre myself and quietly assess the day ahead. I live in an old stone farmhouse in the country so my morning routine is often seasonally influenced. In the winter, I’ll sit by a roaring fire with a mug of coffee with my business partner/life partner. In the summer, we’ll sit outside and do the same. Usually a full breakfast follows and then we’ll take our St. Bernard, Buddha, for a walk around the property. How long have you been following this routine for? Why is it important to you? We moved to the country 5 years ago so that we could realize a better work/life balance. When you have your own business you can easily find yourself working 16 hours days, 7 days/week. The peace of the countryside and the surrounding nature is always calling to be enjoyed. Before moving I lived in downtown Ottawa and downtown Toronto. From the time I woke up to the time I went to bed, I was constantly on the go. I didn’t even eat breakfast or have my coffee at home. I simply woke up and started my day like everyone else. My new routine allows me to bookend my day with the things that inspire me, ground me, and bring me peace. I am usually awake before the alarm clock. In fact, in the summer the roosters start crowing, the cows mooing and the birds start singing long before the sun has fully risen. My brain works the same way. It’s usually working long before I actually wake up. So, no snooze button for me. I am usually fully awake enough to turn my alarm off before it even sounds. Yes, I need at least 9 hours of sleep a night. I don’t function as well without sleep and am known to take naps if I don’t get a full 9 - 10 hours at night. Until this year, I used to roll over and, with eyes barely open, check Facebook. Why? I don’t know. I realized that checking my phone — whether for news or social media updates — wasn’t a very mindful way to start my day. It was harder to live in the moment when I was already running through my day… or swiping through it as the case may be. I now have an old fashioned alarm clock beside my bed. When I wake up, I listen to its gentle tick and quietly ponder all of the things I’m grateful for. I also use that time to set my intention for the day. I do answer email first thing in the morning, again at noon and then later in the day. Because I work in different time zones, I’m very conscious of the fact that someone else might be waiting on me to get their own work done. I take time to read. It makes my morning easier because it allows me to fully shut off my brain and get lost in fictional adventures. Again, I used to check my phone before bed but I now leave it in the kitchen. I use my reading time to recharge and find sources of inspiration that I wouldn’t normally find online. Before sitting down to work, I always spend time with my Day Designer paper-based agenda. For years, I tried to organize my to-dos and calendar virtually but I recently switched back to a paper planner. I find using coloured pencils and physically writing out my schedule helps to clear my mind from a lot of clutter and balance competing priorities. When I travel for work, I don’t have the serenity of the country life. It can throw my day off because I don’t feel as centred. So I try to find things that remind me of home. Even on my most rushed days when I’m on the road, I’ll wake up early so I can find some time to ground myself. Even if I have to work for a few hours before I am onsite with a client, I try to indulge in some quiet time for coffee and jazz or classical music. Recently I have begun using the Calm app for meditating. With background nature sounds and wallpapers, it’s just like waking up at home. Feeling centred is so important to being able to respond thoughtfully to whatever the day brings, and provides ample space for creative ideas to take shape. 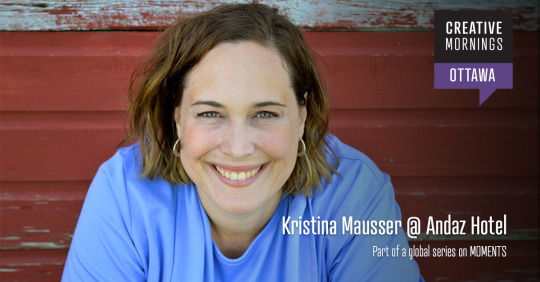 Don’t miss this month talk with Kristina Mausser in partnership with Women in Communications and Technology NCR for a reflective February session on “valuing moments of pause”. Join us at 8:30AM on Friday, February 24 at the beautiful Andaz Hotel in the Byward Market. Free tickets will be released on Friday, February 17. Stay tuned and be sure to RSVP! 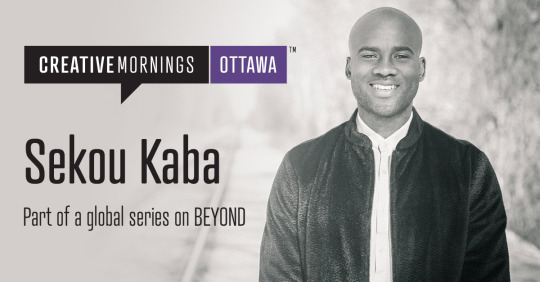 Being the VP of marketing and co-founder of Ottawa’s favourite escape room company takes a lot of hard work and creative energy – And we at CreativeMornings want to know, how does he do it? Every good work day starts somewhere, so we decided to ask Steve how he starts his morning that leads to a productive, enjoyable day – Perhaps with inspiring takeaways to help us think differently about our morning so we can better tackle the busy day ahead! My morning routine is to wake up, lay in bed, go through some gratitude thoughts, do some mindful meditation, followed by a quick mental action plan for the day ahead. I then spring out of bed, do a quick workout, grab a light breakie, and then shower. Game-on. What time do you typically wake up/go to bed? I try to hit the sack for 10pm so I can read or take in a podcast but it generally lands between 10pm and midnight (during the week). I use 7 hours as a baseline but can get by on 5 hours. 8 hours is a dream (literally and figuratively). Say “Good morning world!” Have done this for years. As an entrepreneur, I definitely check my email before getting to work. I only deal with the most important ones and I also have a 5-3 task rule, where I task myself 5 things to get done per day. I do not look at email until the first is done (whenever possible). The goal is to crush 3 of the 5 tasks at minimum per day. It is not an exact science but another one of my works in progress that I have found effective when practiced. Yes, we generally have fun, drink, stay up late and blow off routine in the morning. I also have cream & sugar in my coffee on the weekends! It happens quite regularly and I try to make up for the failures throughout the day and hope to better the next. 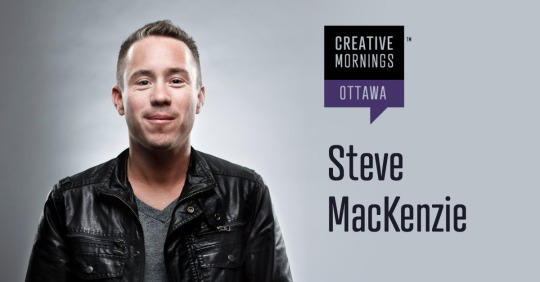 Don’t miss Steve’s CreativeMorning talk on January 27, 2017 at Lowertown Brewery where he will be sharing the creative process behind Ottawa’s favourite escape room company! Free tickets will be released on Monday, January 23. Stay tuned and be sure to RSVP! WHAT DO YOU SEE WHEN YOU FANTASIZE ABOUT THE FUTURE OF SAAS? The tech industry is one of the fastest changing industries in existence, with new advancements being made all the time. SaaS is no exception. In fact, in the last few years alone this sector has seen dramatic growth. The SaaS market is set to continue its rise as service users become increasingly dependent and more knowledgeable about the products they’re using. Industry leaders such as Slack, InVison, Shopify, etc. are not only serving up functional products but also beautifully designed, and aesthetically pleasing products. So how important will design be in the fantastical future of SaaS? Today many B2B software designers aren’t all that concerned with the appearance of a platform. Instead, they’re focused on how the platform functions in the context of the day-to-day life of their users. Function—not form—is the main aspect of product design that SaaS companies have focused on in order to add value for their customers. But the mediation between user and product is a prime place to add value – with intuitive design cutting down training costs, increasing efficiency, loyalty and making for an overall more enjoyable user experience – and companies like the ones above are masters of doing just that. So what does the melding of form and function look like for a SaaS product, and how can it better connect users to the product’s unique features? 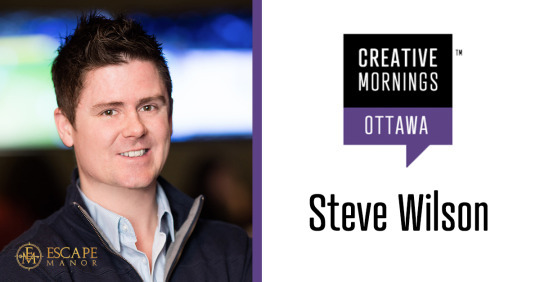 Let’s chat about it next Wednesday, November 30 at our November CreativeMornings with Steve MacKenzie in partnership with SAAS North – Canada’s largest SaaS conference – at the Shaw Centre in Ottawa! We are a species that flourishes when we’re seen, when our work matters, and when we connect with and understand one another. A boss sharing her vision with the team, looking your friend in the eye and telling the truth, or owning your mistakes—none of this is possible without transparency. Where does transparency fit in the word of politics? When you are in a position of power, transparency is paramount to the responsibility that comes with the ability to change people’s lives, is a sign of trust, and seems to be more important than ever before. We may not always see this as the case, but we do see it regularly with one of our local political figures – Mayor Jim Watson. 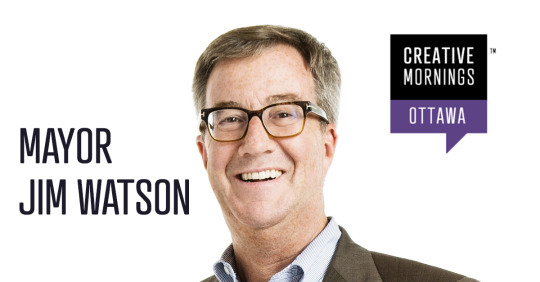 This month’s we’re honoured to welcome Ottawa’s very own Mayor, Jim Watson to the CreativeMornings Ottawa stage to speak to the theme of transparency. As he lives much of his life in the public eye, Ottawans see him regularly at community events celebrating the city’s vibrancy and local successes or simply walking down the street in some random Ottawa neighbourhood. He’s even been dubbed by the Ottawa Citizen as being married to the city. Coming from a background of public relations, he’s always strived to have a good transparent relationship with the city and its local communities. You know he cares about being involved in what’s happening in the city when his website has a big ‘Invite Jim’ button on it. Mayor Watson’s community involvement is like no other, taking part in over a hand full of local organizations including; the Riverside Hospital, the National Arts Centre, the Christmas Exchange of Ottawa and the Forum for Young Canadians, just to name a few. 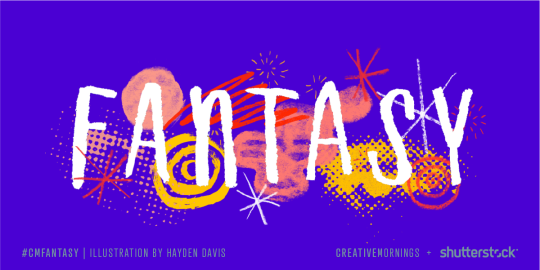 Oh and let’s not forget CreativeMornings, we’ve collaborated in the past to broaden the City’s outreach to the creative community with offers of scholarships. Mayor Watson’s contributions and office expenses are already out there for the world to see, but we will get a chance to hear about his more personal experiences in the political arena. How does a political leader balance accountability and transparency in the civil decision making? What does a mayor take into account for potential conflicts between the community’s and municipality’s different interests? How does he maintain the rights to privacy while living such a transparent life as a politician? 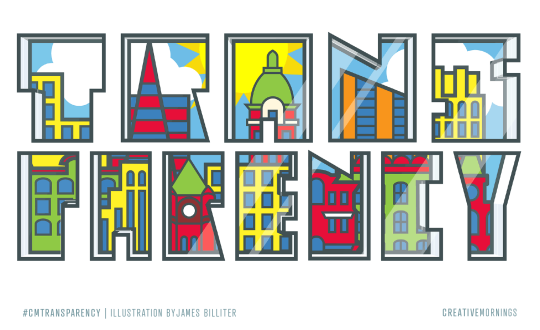 We at CreativeMornings are really excited to have the mayor for this month’s talk, and we hope the event itself would open up some more authentic and transparent dialogue among all of our fellow creatives. For additional event information and tickets click here!